I am now the proud owner of a Fitbit One. It counts steps, miles, calories burned, and has the distinction of also being able to track flights of stairs climbed, sleep, and quality of sleep. It also includes a silent (vibrating) alarm that can be used to wake you up without disturbing anyone you might happen to be sleeping next to. It will also email you to let you know when the battery is getting low and needs a recharge. I have been using it for about a week, now, and really enjoying it. The web app that goes along with it also allows you to log other details, such as water consumption, food, other activities, weight, and a variety of other health related info that might be useful for people needing to keep an eye on info such as blood sugar or blood pressure. It allows you to set goals, and will even help you with weight loss with a dynamic daily calorie consumption plan, based on your current weight, target weight goal, daily calories burned, and how fast you want to lose the weight. Due to chronic foot problems, I have set my daily step goal to be half of the default recommended 10,000 per day. Also, having 3 kidneys and being more prone to dehydration, I have also increased the goal for water consumption. The device itself does have one con that I have noticed, so far. The way it logs floors climbed is that any increase of altitude of 10 ft can result in it registering you as having climbed a floor. This means hills can count as floors. How it does it is with a tiny altimeter that measures changes in air pressure that would normally indicate a change in altitude. But it also can be affected by weather, as it has already done for me. It registered a rather stormy night as me having climbed a few floors in my sleep. On their forum, a woman complained that Hurricane Sandy registered as her having climbed 360 floors in a 1 story house. So, I have chosen to ignore that data and removed the widget from my dashboard and changed the setting on the device to not show floors. The web app has good privacy controls, allowing you to choose what info you make public, what friends can see, and what data to keep private, for your eyes only. It also will post your daily or weekly step counts to Twitter or Facebook, if you choose. The data can also be posted to your accounts on various supported health, fitness, and diet related sites. One thing I have noticed about the web app is that it is subject to the whims of the developers, with them removing features without notice, and they are not always very well thought out changes. Where they had the ability to log 6 meals/snacks per day, they suddenly decided to eliminate the "Anytime" category, that many used to log their evening snacks, reducing the number to 5. (this is also the one I was using to log all of my food, since I don't live by a concept of breakfast/lunch/dinner) Their response to the angry mobs on their forum was to tell them all to go vote for a new feature request to bring it back, but named "Evening Snack" instead, and they will maybe consider it. But all in all, it's a great little gadget that is giving me a reason to get out of the house every day, and doing more walking than just down to the corner and back. Here's my Fitbit profile. If any other DC Fitbit users want to add me, feel free to do so. Switching can be done via physical switches on the kvm unit or via the keyboard -- although the unit looks like it can use an AC adapter, it doesn't come with one and it has worked so far without one. 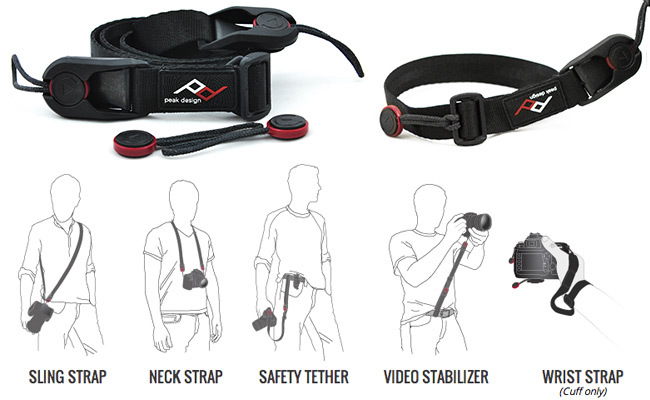 Finally decided to ditch the neck strap and got both Leash & Cuff by Peak Design for my M43 camera. They have an quick connect & release system, and can be configured in a variety of practical ways. This is a bit-taking screwdriver that can be used when you have virtually no access clearance -- it's tiny and it has a ratchet feature so you can tighten or untighten without removing the bit from the screw. It's only $8 and it's about 5 inches long and 1/4 inch thick. Picked up a GOAL ZERO Nomad 7 before I went OS, (I have V1 - previous version of the linked one), for charging the phone while I read ebooks. Looks nifty! Please let us know how well it works as you use it more. Evidence of its hand-crafted nature. This is a low-tech adoption... Nothing so grandiose as some others here. I am one of the poor SOBs with an extremely heavy beard. Electric razors simply burn my face - they're unbearable. That actually wasn't my primary reason though. My primary reason for switching was to try and take money that I was spending all the time and shift it away from a large company and spend my money more effectively with small companies. My purpose there is entirely political. By spending less on blades, I can deprive the state of a tiny bit of tax revenue there. etc. etc. etc. Many reasons and motivations. I'll skip all of that as it's ranty and I'm lazy. So I started looking around and decided to go with a safety razor after reading a lot and watching some videos about them. I ended up with a Merkur Futur 701 (761? whatever...) adjustable razor (against all advice people gave). It's nice as I can adjust it and am not locked into buying multiple razors then. It's also more expensive than others, but I figured the flexibility would be worth it. Once my canned shaving gel ran out, I ordered some real shaving cream - Taylor of Old Bond Street - Jermyn Street Collection shaving cream for sensitive skin, and a stick of "Arko Shave Stick Soap" just for the heck of it (not tried it yet). Well... HOLY MOTHER OF THE UNIVERSE!!! Real shaving cream is NOTHING like that canned crap! It's crazy! Insane! I'd never used it before... WOW! Just. Wow. The white stick (in the photo above) is a stypstik pen (alum) for when you cut yourself. I never actually need it, but it's good to have in the house for multiple reasons. The stuff has been around for thousands of years (literally). The blades make a big difference though. I'll be trying out more in the future, but for now, I like the Personna best with the Feather blades coming in a close second. I forget about the Shark blades - been a while since I used one. I'm not all that keen on the Merkur blades. Shaving is a real PITA, but I find that I'm enjoying shaving a lot more with this setup. The razor's weight and feel are really nice. It glides over my face nicely with no pressure, and using a real shaving cream makes it infinitely nicer. The shaving cream I use only takes a very, very tiny amount. So far I have not managed to get "just enough" on. I keep using a bit too much. I'm guessing this is going to last a long time. Given how much nicer this stuff is, I am a bit baffled about why anyone would every use canned shaving cream. Seriously. It's the difference between a rusty bike that you pulled out of the river and galactic star cruiser equipped with Lambos and a teleporter. I REALLY wish that someone had have told me about this a LOT sooner. They seem to have about the best prices for most things. They put out some decent videos and reviews. Stretch your dollar a little further. Nifty little things, blade holder pops out the side, put a blade in, slide it back in and pop the crank handle out the other side to give it a few turns. I tried looking, but I couldn't find any new ones, and I'm guessing that antique ones won't be useful due to the leather being too old & unmaintained. But, I'll keep looking. Every time I change blades, I keep thinking of straight razors and stropping them, and wondering why I'm wasting a blade that can perfectly well be sharpened to use again. It seems wasteful. God knows a "dull" razor blade is still incredibly sharp. Getting a real shaving kit is an idea I've been toying with, though my facial hair is so sparse as to be just a level or two above peach fuzz. As far as extending the life of your blades: when I was a kid you could get a small pyramid that you'd put your razor blades inside in order to keep them sharp through 'pyramid power'. I imagine that Gillette did something to suppress that technology. I think you should test it out. Renegade, when I was using double-edged blades - Gillete, Shick - it was common practice to strop the blade against a bathroom mirror. That realigned the edges, smoothing out the parts that had been realigned/misaligned by the act of shaving. Dunno that might help ya, but it's worth a try. Saved me a great deal of discomfort when I couldn't afford a new blade every day. But you might just enjoy it. Think of it as entertainment at that point. Real shaving cream is simply fantastic... The stuff you get at a good barber? Yeah - better. While I do love a good conspiracy and whatnot, I'm thinking that pyramid crystal new age power is bit off the beaten track for me. Heh! I'd not see that before. But really... more blades in disposables is better. A lot better. And a lot more expensive. Quite literally, I'll go through multiple multi-blade disposable razors for 1 shave if I let my beard go too long. And that's when I buzz it off with clippers beforehand. But multi-blade disposables are darn good. Hmm... Mirrors... I'll have to give it a shot. Can't hurt. Well, yeah - it could hurt. I'll hold the blade with a towel or take other precautions. I've worked with blades for far too long to take anything for granted. Razors? God... Deep razor cuts are sick - been close enough there. Tomos! You're a *sharp* guy! Still waiting for those photos! Thermomix. Totally insane. Just crazy what you can do with it. Off the hook. No words to describe it. I'd heard about it and thought, "Meh, whatever." No... It's simply mind-blowing. So, how has this one been since your original post? I use it all the time. All the time. It's simply so much better than any food processor I've ever used. Yesterday I used it to prepare everything for the slow cooker. Did a large slow cooked roast in salsa that I made in the Thermomix very quickly. It was super easy and fast, and man... I think it was some of the best cooking I've done. Salsa in the TM - roast in the slow cooker - just to clear that up. Quarter an onion & throw it in with some garlic cloves. Chop it finely with the TM - level 7 or so. Throw in coriander/cilantro. Same deal - chop finely again. Quarter or halve up the onions, roma tomatoes, and chop bell peppers into large chunks --- you can be as sloppy as you want there. Chop at level 4. That takes less than a minute. Doing that manually would take an extra 15 minutes easily. Depends on how much you make. With the TM, it doesn't really matter whether you spend 1 minute or 2 for double the amount. Garlic cloves & halved onions --> Chop at level 7 for, oh, 3 seconds. Pour in 30 grams of olive oil - the TM measures it for you! Saute in TM for 3 minutes while you get other ingredients ready. I'd say that I pretty much use it for 75%+ of all the cooking I do. It's insanely versatile. However, once you get used to the TM, you can do almost any recipe in it. Oh! Steaming! Great for that! Steam meat or cabbage rolls while you cook the sauce in the TM --- doing 2 things at the same time. It also makes cooking a lot more fun. I've learned to cook a LOT more things with it. Stuff that I never would have imagined trying. Oh, and ice cream or sorbet! Super easy to make in the TM. and it doesn't phone home to the NSA. After my "bag holder opener" gadget post, DC members ewemoa, app103, and I were brainstorming about ways to use existing kitchen tools to hold open bags more effectively. I believe we came up with an ideal solution, which is to use some thin flexible plasting cutting mats, and roll them up and place them INSIDE the bag like an expanding tube. It maximally holds open the bag (this is a huge advantage over the gadget, which only holds open the bag a tiny bit). It takes up NO storage space (compared to gadget which does) and requires no setup. It is super easy to clean and acts like a funnel. Works on any size bag (you could even trim the plastic cutting mat to make a smaller size one for small quart bags. As ewemoa has pointed out, one drawback of this approach is that you have to wash the cutting mat after use. One alternative would be to use an INNER bag draped over the "tube". That will work providing the mat is not too oversized. Of course this will also work if you happen to have a pitcher of the right radius and height -- without need for mat at all. That's a great idea, and I've even got those flexible cutting 'boards'. On a meta level, I've been wanting to figure out more things like that, i.e. repurposing things for other than their intended uses. Probably the most obvious is the cardboard box - it is most easily repurposed as a toy for small children! "Hey. Here's a box. Have fun!" A couple weeks ago I bought a new productivity tool. It's probably one of my most valuable productivity tools, and helps me get so much done that I couldn't even begin to describe just how amazing this is. As an information junkie, and being incapable of not having information streaming into my glassy eyes at every waking second, it is very difficult to do things like, oh, say wash the dishes, etc. So, this sits in the kitchen where it gets plugged into my tablet so I can play podcasts and videos of interviews. e.g. The Tom Woods show, The Corbett Report, etc. I have to turn up the volume full blast if I've got the tap running in the kitchen, so it's not really loud, but it's about loud enough. That it's a single speaker makes it a bit more compact, though there is still that volume issue. Overall, it's about the right volume for a room at full volume if you're cleaning. Vacuuming is out of the question though. Also, the Thermomix is loud, but that's only for 3 seconds (usually less). I wouldn't recommend it if you're looking for great stereo audio quality for music while you're cleaning. It's much better suited to podcasts and talks. Speaking of repurposing, buy yourself another one of those shave brushes and use it exclusively for this. Given the price of them here (everything here is expensive compared to there), a cheap, small paint brush might be better, but yes - definitely an idea. We've got a calligraphy paint brush around here somewhere. It would likely be ideal as it's long and thin enough to get into those tighter spots, e.g. between components. a cheap, small paint brush might be better, but yes - definitely an idea. Please be sure not to buy anything synthetic for the job, and only those bristle types that are naturally anti-static (badger, black sable, boar). And don't reuse brushes that have been previously used for paint or other substances.